Many seniors deal with achy joints and soreness as they get older, but that doesn’t mean they can’t enjoy the benefits of non-impact exercise. Physical activity is essential to staying healthy and living a more balanced life. Thankfully, there are many ways to break a sweat while putting minimal impact on your bones – and some workouts require no impact at all. Aerobics are a great way to burn a lot of calories in a short amount of time, but performing them on the floor can be painful if you suffer from weak bones or arthritis. Not only do water aerobics allow you to build muscle by pushing against the natural resistance of the water, but you will have little to no impact on your feet and knees. Like water aerobics, swimming is a full-body workout that requires a lot of endurance and cardio activity, while also being a non-impact exercise. With swimming, both your upper and lower body are engaged, so even short swimming sprints can make a big difference in your fitness level. Even though this activity is very effective, there is no pressure put on your joints. If you are rehabbing from an injury, your doctor will likely advise you to swim or perform water aerobics, as they can help rejuvenate your muscles. For some of us, exercise just isn’t exercise without feeling the fresh air. Cycling is perfect for those who love the great outdoors, and while it offers less impact it is nonetheless physically demanding. According to Prevention magazine, you can burn up to 381 caloriesfrom cycling at a moderate pace for just 45 minutes. Another great benefit of cycling is you can enjoy these workouts solo or in a group, making it very versatile. To be really kind to your joints, consider getting fitted for your bike so that you don’t overexert your knees or feet. 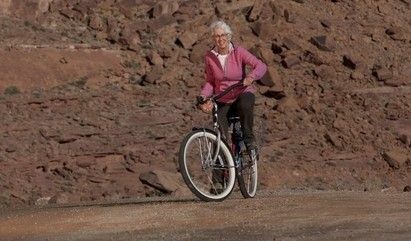 For older adults or those with balance issues an indoor recumbent bike is a safer way to get the pleasure of cycling. Yoga may look like a peaceful series of stretches coupled with meditation, but while that may be true, many seniors have found that they have been able to sculpt muscles and work on their balance more effectively through asanas. There are many different forms of yoga, but all typically raise your heart rate, are focused on breathing, elevate your mood and keep your weight in control. Because yoga is so focused on stretching and breathing, people with joint issues should have no problem with these movements. Most gyms offer rowing machines, which put very little pressure on your joints. Watching someone row may look simple enough, but these machines offer a full-body fitness session that works the arms, chest, back, shoulders and legs using a graceful sliding motion. Because these movements are so fluid, rowing could also help you with range of motion and balance. Just be sure that you learn the proper technique from a gym instructor before you hop on so that you reduce your risk of injury. Aging doesn’t mean that you have to let exercise fall by the wayside. With non-impact exercise, you can still enjoy the benefits of fitness with little to no pressure on your joints. Be sure to check with your physician before starting a new exercise regimen. Contact the Aegis Living community near you to speak with our Life Enrichment Director and learn more about non-impact exercises we offer our residents.